Genius. Civil rights activist. Legend. 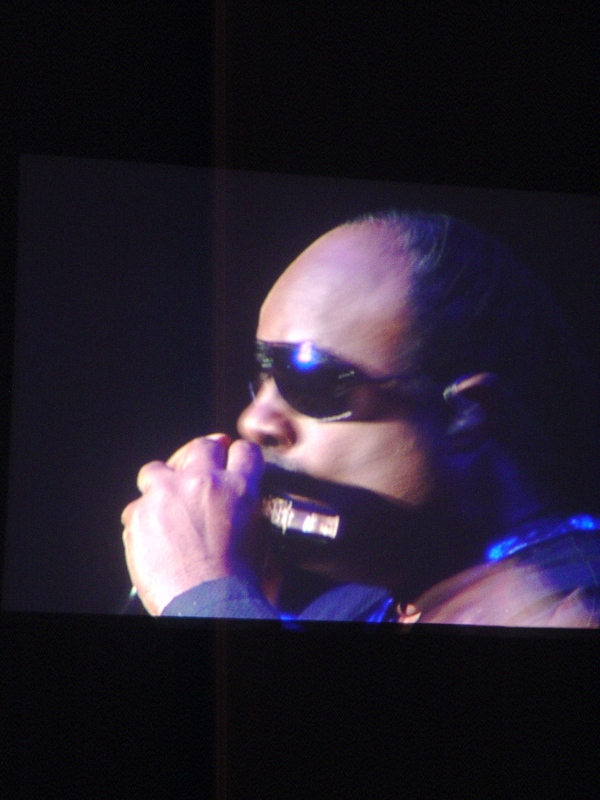 Stevie Wonder came to town and we worshipped. I cannot believe I was in the same room as this giant. From the first bars of Master Blaster, his first track, to the very last notes, or the last song I was enthralled. He changed the lyrics of Master Blaster, swapping an endorsement of Barack Obama for president for the sadly out-of-date words about peace in Zimbabwe. Now in his late fifties, Wonder’s voice is still amazingly strong and powerful. He sounded better than he did as a teenager. Early in the piece he dedicated the concert to the late Levi Stubbs of the Four Tops, who’d died the day before. He led a cover of “Sugar Pie Honey Bunch” which had the crown on their feet singing along. His band was tight. The backing singers included his daughter Ayesha who performed solo part-way through the concert. Hearing Wonder himself perform such songs as Sir Duke, Very Superstitious, and Higher Ground were some of the highlights of the year for me.